The AR-1202RTC architectural dimmer from Lightronics is wireless and includes 16 universes of 512 DMX channels, real-time FHSS TDMA communication, and 83 channel-hopping 2.45GHz band. The dimmer also has a range of 1400 feet inside a structure and 4000 feet outside. The device features a programmable calendar/clock that enables the user to attach scenes to date and time commands. 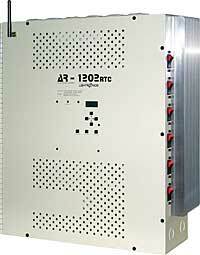 The AR-1202RTC is covered by a five-year warranty.